Archive for the ‘Applied Kinesiology’ Category. Muscle Testing 101: How It Works! Wondering about Muscle Testing? Watch this short video! Dr. Trent Burrup explains how Muscle Testing, (a.k.a. Applied Kinesiology) works and how it is used in a Chiropractic Visit. For more information on Applied Kinesiology, please see our AK page HERE. 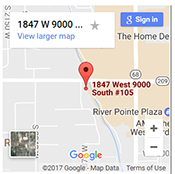 The Institute of Chiropractic & Acupuncture Therapy provides wellness care in Salt Lake City and surrounding areas including West Jordan, South Jordan, Sandy, Draper, Taylorsville, Murray, Riverton, Herriman, Bluffdale, Cottonwood Heights, Holiday, Millcreek, West Valley City, and South Salt Lake. We also provide service to patients that come from the Utah County area and as far north as Logan, and even some from out of state…come experience the difference at The Institute! Category: Applied Kinesiology, Chiropractor, Natural and Holistic Health Care, Therapies | Comments Off on Muscle Testing 101: How It Works! Meet our Chiropractor, Dr. Trent Burrup. Dr. Burrup attended chiropractic school at Palmer College of Chiropractic in Davenport, Iowa. In addition to being a Chiropractor, Dr. Burrup is certified in Acupuncture, Applied Kinesiology, CranioSacral Therapy, Class 4 Laser Therapy, and is certified in Extremity Adjustments. The Institute of Chiropractic and Acupuncture Therapy provides chiropractic care and other wellness services to patients in the West Jordan and entire Salt Lake Metro Area. We also have patients from Utah County, from as far north as Logan, and even some from out of state. Come experience the difference at the Institute!